In stock now. The 2012, Seven in Heaven series! Get your copy now! State of Origin: Three simple words that send rugby league fans into a veritable frenzy. In the blue corner, the enemy from the south. In the other, our mighty Maroons. Since 1980 – when Queenslanders, who had been lured away by the richer Sydney clubs, were allowed to represent their native state – these two tribes have been going to war. It is unchallenged as the greatest rivalry in Australian sport and produces an annual three-part spectacle that showcases the code at its very best. It has left us with a welter of wonderful memories; from thunderous hits to scintillating tries, great escapes and legendary names, like Lewis, Meninga, Beetson and Langer. 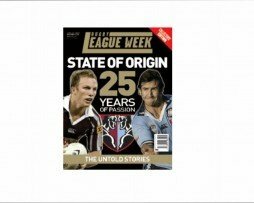 Here, for this first time, are all those magic moments, from a proudly parochial Queensland point of view – over one hundred minutes of highlights from the 25 most significant victories in Queensland. In stock now – new for 2012. Collector’s edition boxed DVD set celebrating Queensland’s 6 series wins! 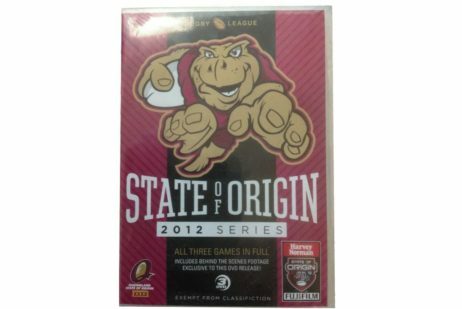 Great gift for the NRL State of Origin fan! Beautifully boxed in a gift box. A total of 18 discs in 6 dvd cases!